An all new book of 322 tunes. Paul Cranford's done it again. Here's an outstanding new book of 322 tunes from the repertoire of one of the finest fiddlers anywhere. It contains great tunes in great settings that reflect Jerry Holland's musical ideas at the turn of the century. This well-crafted book is a collaborative effort of artist and editor and it must have taken many months because everything about the book reflects time and effort and there are so many tunes in it. "The Second Collection" has a lot of traditional Scots and Irish tunes, others from Cape Breton and other parts of Canada, and recent tunes written by 57 modern day composers (mostly fiddlers, but the works of pipers, box players and guitarists are also presented in fiddle-friendly versions.) Amongst the 57 are 120 tunes composed by Jerry himself. When it comes to traditional music the oft-printed phrases "pushing the envelope" and "expanding the borders" and, all too often , "not merely traditional music" (!) are fancy phrases for "unattentive to detail and unable to accommodate to existing parameters". Fortunately there are people like Jerry Holland who so thoroughly understand the essence of the older music they are able to bring it forward not only without damaging the tradition but whose works actually strengthen it. Jerry Holland has, in his composing, been so alert to melodic integrity and various types of Celtic nuance that he has created tunes so stylistically exact that one's first reaction on hearing one is "where did you learn that?" rather than "did you make that?". 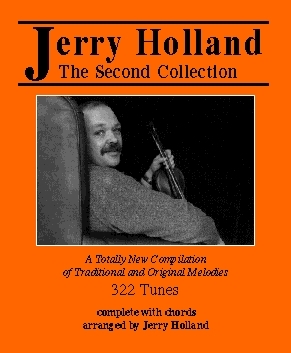 At the same time, in his arranging of traditional tunes well known and rare, he is always true to himself, always Jerry Holland. Paul Cranford has written an insightful introduction and his informative footnotes to the tunes appear on nearly every page. These do not clutter the page and they add immeasurably to our appreciation of the music. The book opens flat and will not fall apart; the tunes are printed big and clear. There are even chords given to all the tunes and...are you sitting down?...they make sense. These were carefully chosen by Jerry, who is also a guitarist and pianist. These chords are valuable as a basic starting point for accompanists but also a gift to fiddlers. Having the artist's basic harmonic view of a tune as well as the melodic, rhythmic, ornamental and bowing aspects, is a big plus, I think. Did I mention nice old photos?